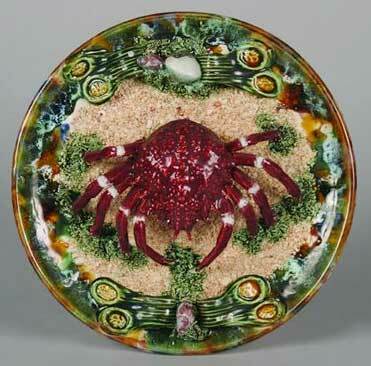 Majolica: A Portuguese Palissy Ware Charger with a central application of a crab surrounded by sea life, F. Mendes, LDA, Portugal, Caldas de Rainha, Telef. 23628, also marked with the number 489. Diameter 12 inches. This hand decorated charger is one of the best examples of Portuguese Palissy Ware majolica. It is highly detailed of the sea bottom with a large crab surrounded by seaweed, oysters, clams, and anemones. The colors are rich and amazingly realistic. This crab definitely looks good enough to eat! This piece is in excellent condition with no damage. Circa: 20th century.